Landscape, nature and wildlife photography and footage of best worldwide locations. 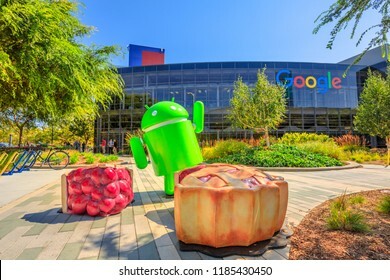 Monuments and architecture photos and videos from capitals cities. 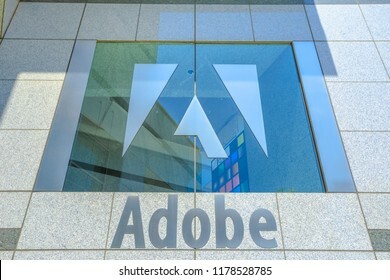 11,191 stock photos, vectors, and illustrations are available royalty-free. 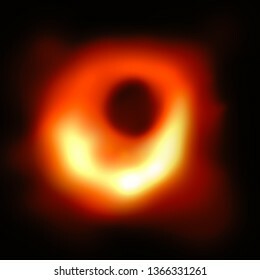 ILLUSTRATION: Visual representation of first picture of a Black Hole, revealed on 10th April 2019 by the scientists. Black hole at the center of galaxy Messier 87, or M87. background wth copy space. Panorama of Coronado old pier reflecting on in San Diego Bay from Coronado Island, California, USA. San Diego cityscape skyline with Downtown and Waterfront Marina District at twilight on background. 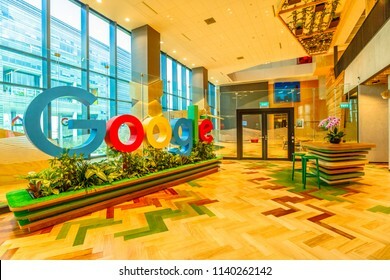 Singapore - May 5, 2018: Google sign in the new offices of Google Headquarters in Mapletree Business City II, Singapore. 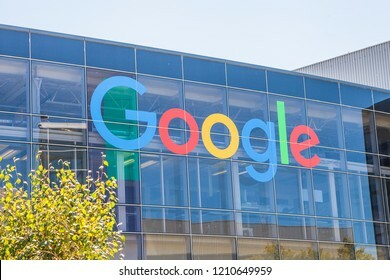 Google's Asia-Pacific HQ with employs 1000 people. Wild deer in Nara Park in Japan. 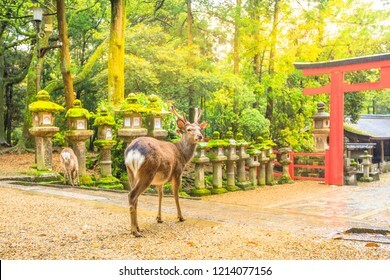 Deer are symbol of Nara's greatest tourist attraction. On background, red Torii gate of Kasuga Taisha Shine one of the most popular temples in Nara City. 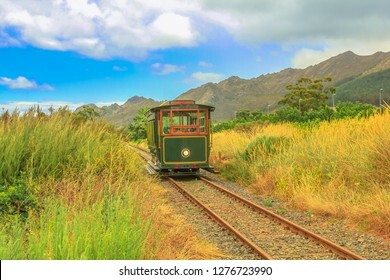 Franschhoek Wine Tram hop-on hop-off tour, one of the best ways to discover Franschhoek Valley in scenic landscape of Wine Region, near Cape Town, South Africa. 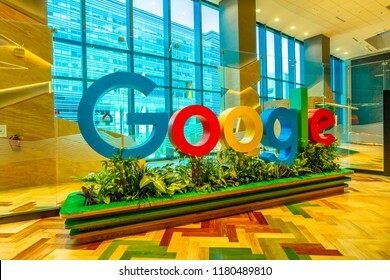 Singapore - May 5, 2018: closeup of Google sign inside a new office to house fast growing team of engineers in Singapore. 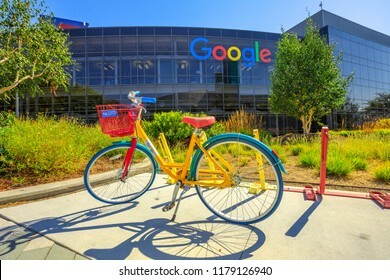 Google's Asia-Pacific Headquarters con employs 1000 people. 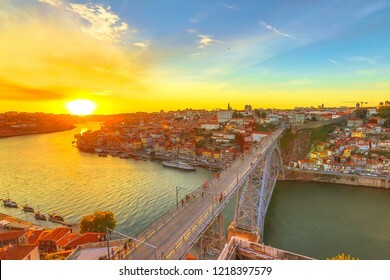 Sunset light on Douro River from Serra do Pilar at Vila Nova de Gaia, Oporto, POrtugal in Europe. Dom Luis I is the most iconic and famous of these bridges. 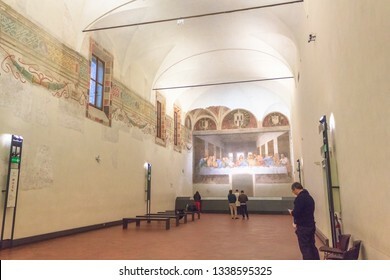 Milan, Italy - November 15, 2016: refectory of church Santa Maria Delle Grazie in Milan in Italy, hosting The Last Supper masterpiece of late 1490s, after restoration. right side point of view. 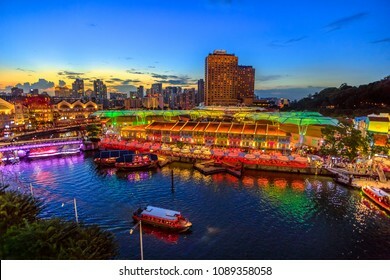 Scenic aerial view of Clarke Quay and Riverside area at blue hour in Singapore, Southeast Asia. Waterfront skyline reflected on Singapore River. Popular attraction for nightlife. 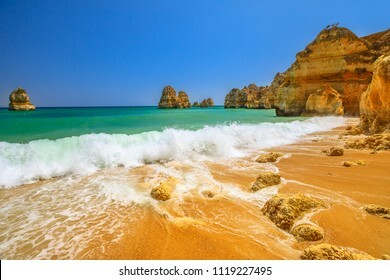 Tourism in Algarve. Summer holidays in Portugal, Europe. 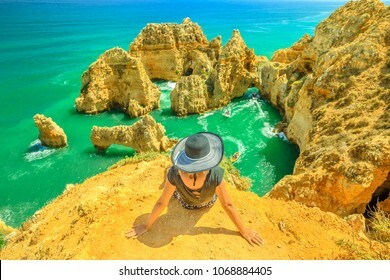 Lifestyle tourist sitting on promontory of Ponta da Piedade. Caucasian woman looking amazing views of iconic cliffs of turquoise sea of Lagos. 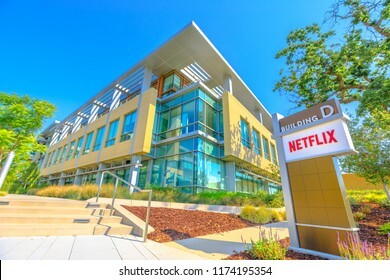 Los Gatos, California, United States - August 12, 2018: Netflix Logo at Netflix Headquarters in Silicon Valley, Ca. 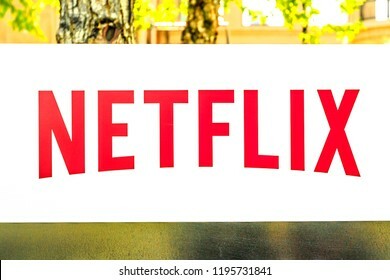 Netflix is an entertainment service provider for movies and tv. 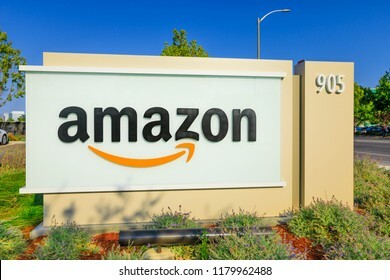 Sunnyvale, California, USA - August 13, 2018: closeup of Amazon Sign at Enterprise Way, the Big Amazon campus in Sunnyvale, Silicon Valley. Amazon is leader in electronic commerce. 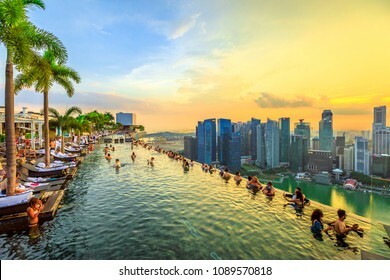 Singapore - May 3, 2018: Infinity Pool at sunset of Skypark that tops the Marina Bay Sands Hotel and Casino from rooftop of La Vie Club Lounge on 57th floor. Financial district skyline on background. 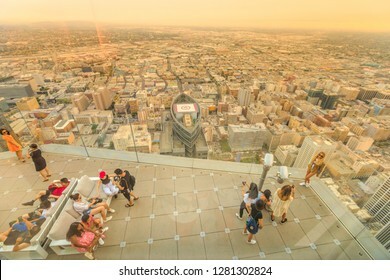 Los Angeles, California, United States - August 9, 2018: aerial view of tourists take photo onpanoramic terrace at twilight. People look at LA Downtown skyline from Oue Skyspace U.S. Bank Tower. 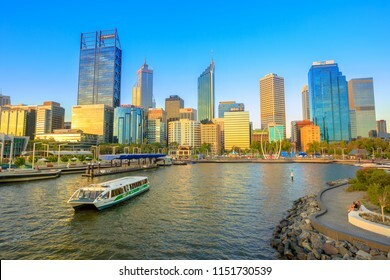 Perth, Australia - Jan 6, 2018: turistic ferry in Elizabeth Quay Marina at sunset with skyscrapers of Central Business District on background in Perth, Western Australia. 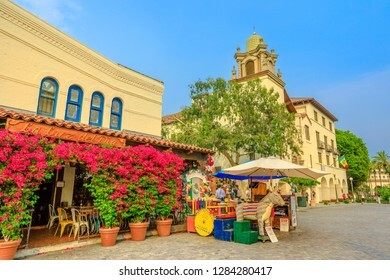 Los Angeles, California, United States - August 9, 2018: La Luz Del Dia Restaurant and La Plaza United Methodist Church in Old Plaza, Olvera Streets, downtown LA, Los Angeles State Historic Landmark. 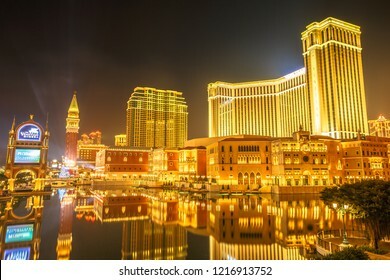 Macau, China - December 9, 2016: Venetian Macao by night, golden colors of this resort and Casino at night seen from Galaxy Cotai Strip. 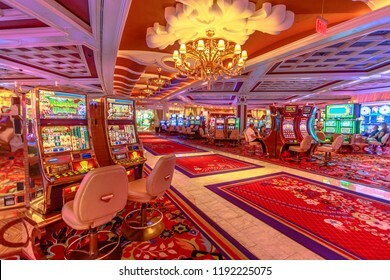 Gambling tourism is Macau's biggest source of revenue. 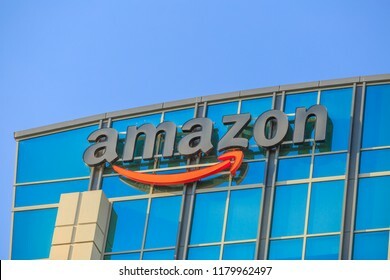 Sunnyvale, California, USA - August 13, 2018: closeup of Amazon Sign atop of glass building of Big Amazon campus in Silicon Valley. 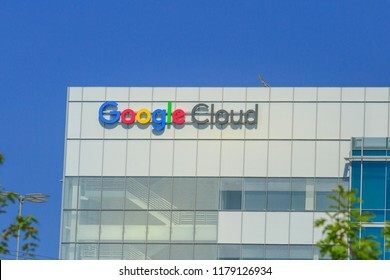 Amazon is leader in electronic commerce and cloud computing. 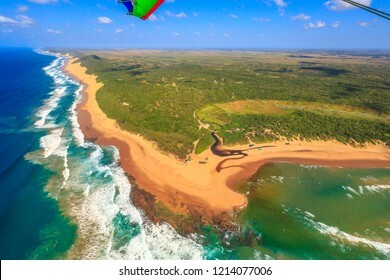 Aerial view of Sodwana Bay National Park within the iSimangaliso Wetland Park, Maputaland, an area of KwaZulu-Natal on the east coast of South Africa. 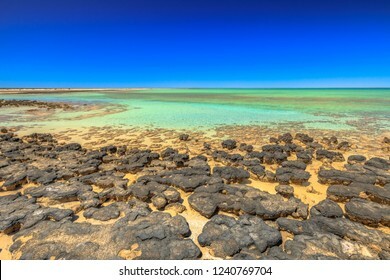 Indian Ocean landscape. 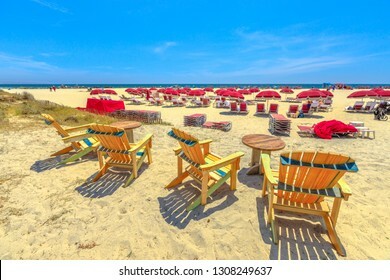 Sea chairs in Coronado Beach along Ocean Boulevard on Pacific Ocean, Coronado Island, San Diego. Summer season in West Coast, USA. Blue sky with copy space. Summer holidays in California. 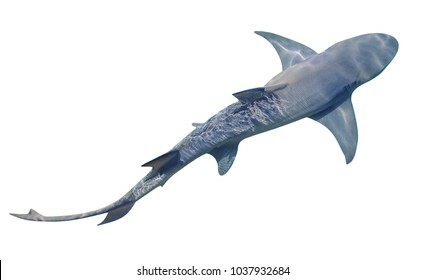 A Sicklefin Lemon shark, Negaprion acutidens, isolated on white background. The Lemon shark lives in the sandy reef near the edge of water. Copy space. View from top. 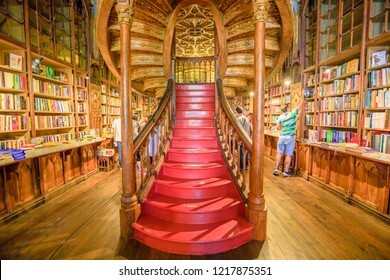 Oporto, Portugal - August 13, 2017: large wooden staircase with red steps inside Library Lello and Irmao in historic center of Porto, famous for Harry Potter film. Horizontal shot. 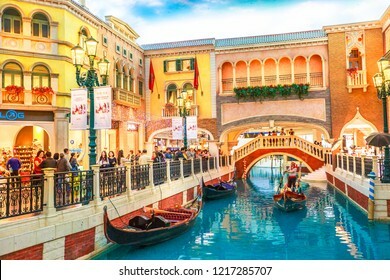 Blonde woman on balcony looking canals of Venice, a Venetian style waterfront village in sunny day. Caucasian tourist enjoys Qanat Quartier in the Pearl-Qatar, icon of Doha, Persian Gulf, Middle East. 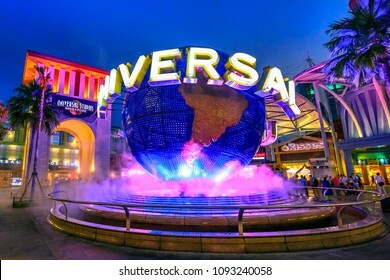 Singapore - May 2, 2018: Universal Studios world globe in green light, with tourists visiting this Hollywood movie theme park in Sentosa island. 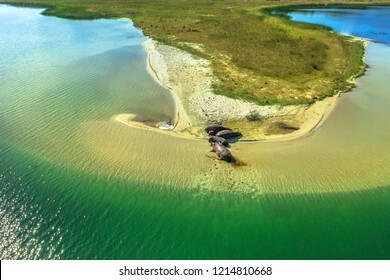 Aerial view of South African hippopotamus family. Cape hippopotamus sleeping on a shore of St Lucia Estuary in iSimangaliso Wetland Park, South Africa. 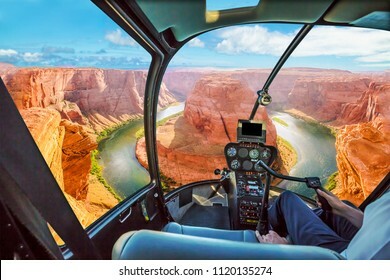 Scenic tourist flight. 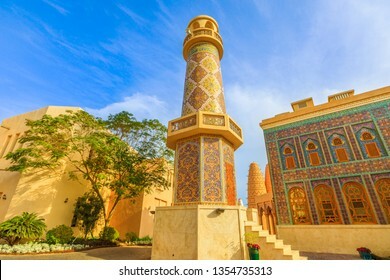 Historic Minaret of the Mosque in Katara. 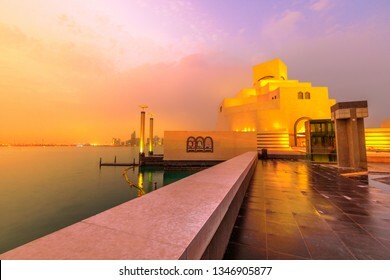 Katara is a cultural village also named valley of cultures in Doha, West Bay, Qatar. Middle East, Arabian Peninsula. 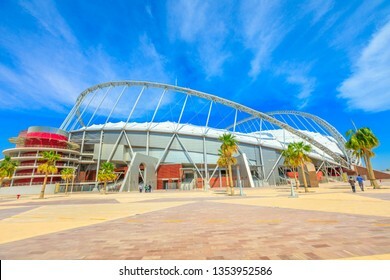 Doha, Qatar - February 21, 2019: Khalifa National Stadium the main stadium of Qatar in Aspire Park, will host the 2022 World Cup. Finally completed and renovated, fully covered with air conditioning. 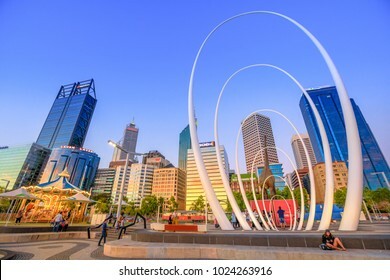 Perth, Australia - Jan 6, 2018: famous landmark in Perth Downtown: Esplanade, skyscrapers of Central Business District, Elizabeth Quay Carousel and Spanda Sculpture in Elizabeth Quay. Sunset light. Scenic landscape of iconic Santa Monica Pier at orange sunset sky from the beach on Paficif Ocean. Santa Monica Historic Landmark, California, USA. Wide banner panorama. 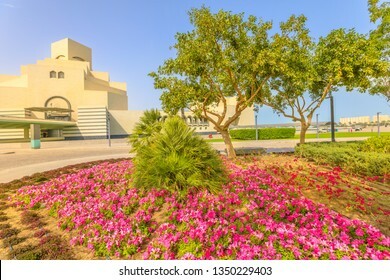 Flower beds and blooming trees along seafront of Doha Bay in Doha park. Popular tourist attraction near Corniche in city center. Qatar, Middle East, Arabian Peninsula, Persian Gulf. Sunny blue sky. 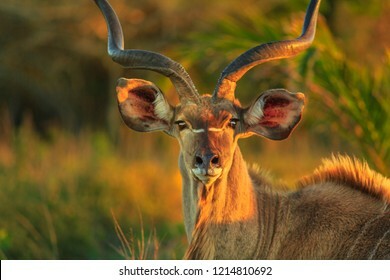 Front view of portrait of male Greater kudu, a species of antelope at sunset light. Game drive safari in iSimangaliso Wetland Park, South Africa. Tragelaphus Strepsiceros species. 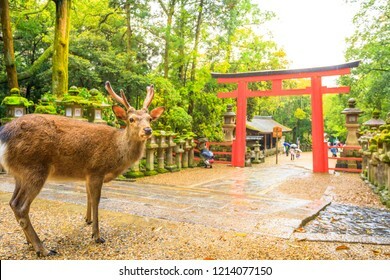 Wild deer and Torii gate of Nara Park in Japan. Deer are Nara's greatest tourist attraction. 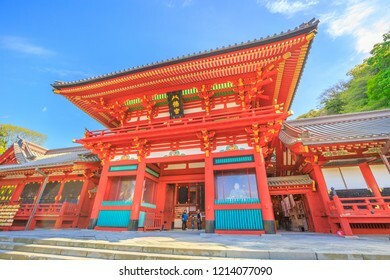 red Torii gate of Kasuga Taisha Shine one of the most popular temples in Nara City. Banner astronomical background. Full red moon phases by night. The total phases of the lunar eclipse. Wide panorama. Doha seafront and West Bay skyline along Corniche in Qatari capital with Dhow Harbour lighting at blue hour. 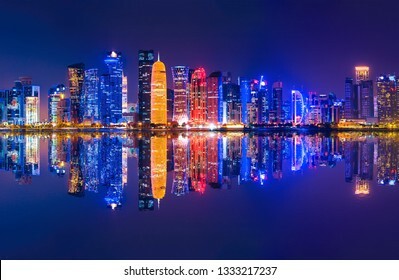 Doha in Qatar. Middle East, Arabian Peninsula, Persian Gulf. Twilight shot. 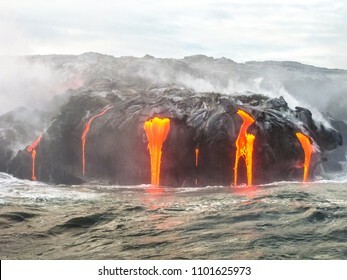 Close up of Kilauea Volcano, Hawaii Volcanoes National Park, also known Kilauea Smile because from 2016 seems to smile, erupting lava into Pacific Ocean, Big Island. Scenic sea view from the boat. 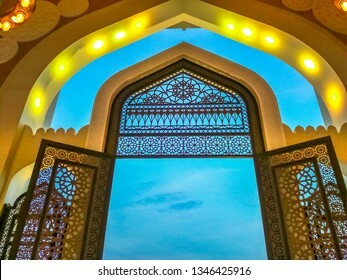 Decorated entrance gate of Grand Mosque in West Bay area, Doha in Qatar. 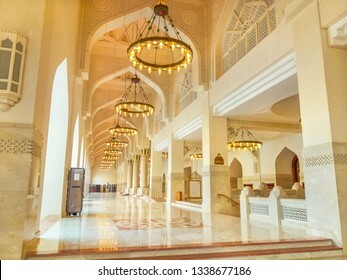 Qatar State Mosque in arab style, Middle East, Arabian Peninsula. Evening sky. 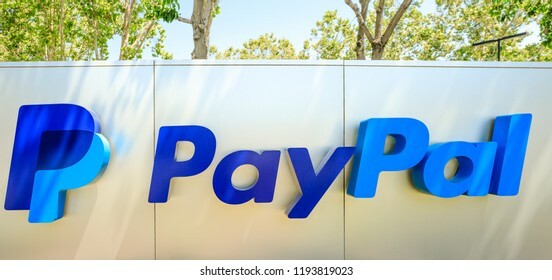 Abstract business background. Concept of powerful United States American Dollar. 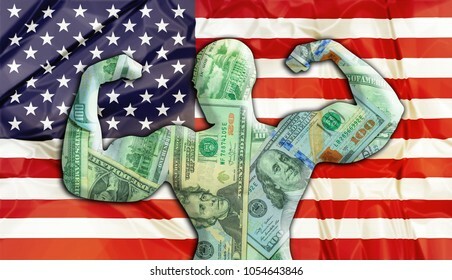 United States Flag and bodybuilder shaped USD currency. Financial concept about exchange rate of American dollars. 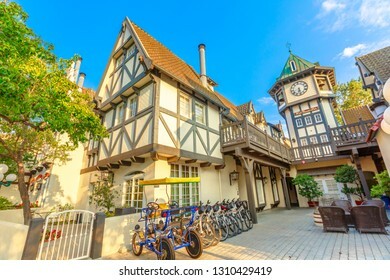 Solvang, California, United States - August 10, 2018: old clock tower in Solvang historic downtown, Santa Ynez Valley in Santa Barbara County. A Danish Village is a popular tourist attraction. 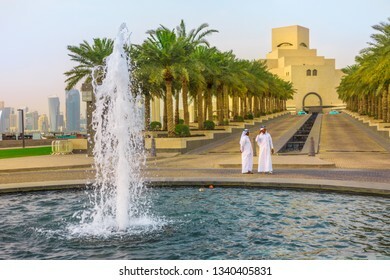 Doha, Qatar - February 16, 2019: two Arabs standing near fountain of Museum of Islamic Art with skyscrapers of West Bay skyline on background. Middle East, Arabian Peninsula, Persian Gulf. 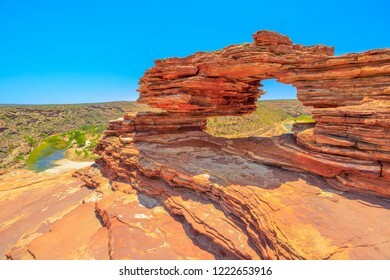 Nature's Window over Murchison River Gorge in Kalbarri National Park, Western Australia. The red rock sandstone arch is the most iconic natural attractions in WA. 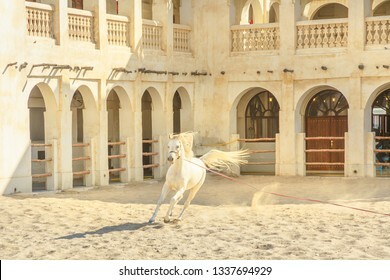 Purebred white Arabian horse running in a paddock in Doha city center, Capital of Qatar. The traditional stables are part of old Souq Waqif market area. Middle East, Arabian Peninsula in Persian Gulf. 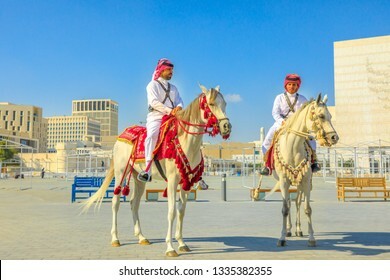 Doha, Qatar - February 20, 2019: two heritage Police Officers in traditional 1940s Qatari uniform riding white Arabian Horses at square of Souq Waqif. Popular tourist attraction in Doha city center. 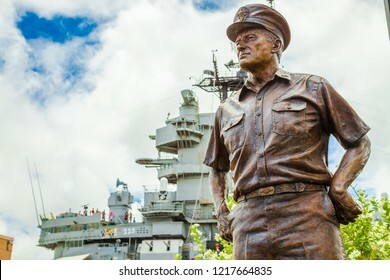 HONOLULU, OAHU, HAWAII, USA - AUGUST 21, 2016: statue portrait of Admiral Chester W. Nimitz, represented the United States during surrender of Japan aboard USS Missouri in Tokyo Bay 1945. 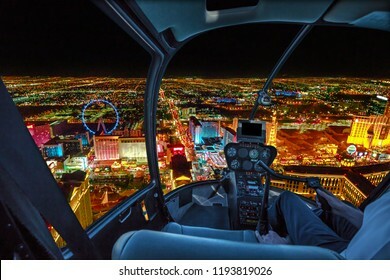 Aerial view of Los Angeles skyline in California, United States. 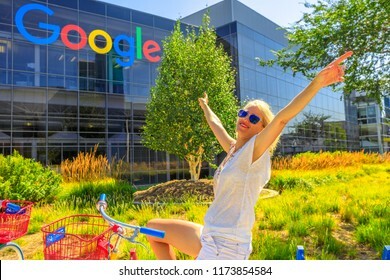 Travel and tourism american concept. 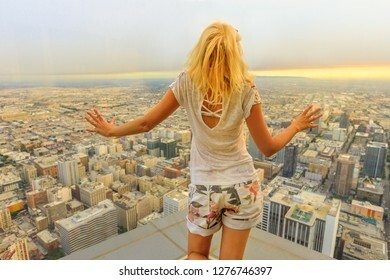 Blonde tourist woman looking at Downtown of LA cityscape from observation deck. Sunset shot. 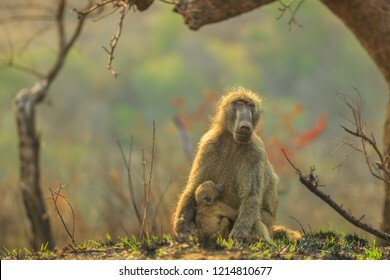 Chacma Baboon mum with baby, species Papio ursinus, sitting on the tree in nature forest. Cape baby baboon hugs mom. Game drive safari in Hluhluwe-iMfolozi Reserve, South Africa. Copy space. The Capital city of Qatar by night. Doha West Bay skyline reflecting in Doha Bay. Modern glassed skyscrapers of Doha in Qatar, Middle East, Arabian Peninsula in Persian Gulf. Night urban scenary. 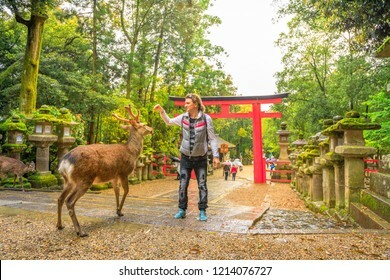 Young male tourist feeds with deer biscuit at Nara wild deer in a public park of Nara, Japan. Red Torii and stone lanterns on background. Tourism and travel concept. Spring rain day. 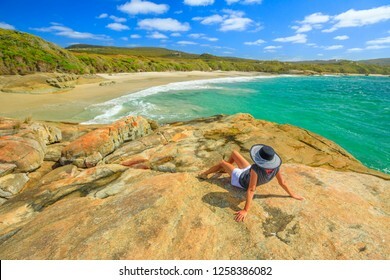 Woman in hat sunbathing on the rocks of Waterfall beach in Denmark, Western Australia. Caucasian tourist looking Great Southern Ocean in William Bay NP. 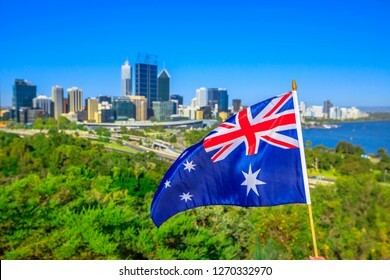 Summer destination in Australia. 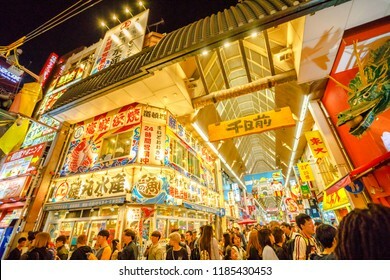 Osaka, Japan - April 29, 2017: crowd of people for Golden Week at entrance of Ebisu Bashi-Suji Shopping Street with its colorful neon in Namba District, one of main tourist destinations in Osaka. 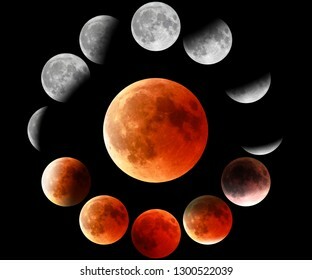 Full red moon phases in circle on black background. The total phases of the lunar eclipse turning red. Panorama of Mount Sinai in Sinai Peninsula of Egypt. Dawn of the holy summit of Mount Sinai, Aka Jebel Musa, know also as Mount of Ten Commandments or Mount of Moses. 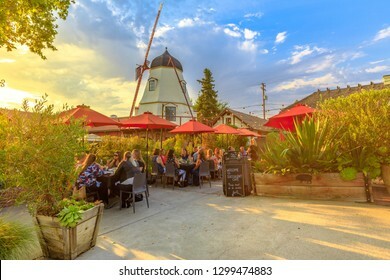 Solvang, California, United States - August 10, 2018: people at a coffee shop enjoy picturesque Danish architecture of Solvang. Old Windmill at sunset. Santa Ynez Valley in Santa Barbara County. Old Windmill in a sunny day with blue sky. Santa Ynez Valley, California, United States. 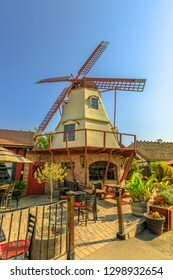 Solvang is a Danish Village, known for its windmills. Popular travel destination. Vertical shot. 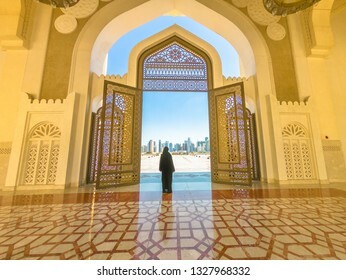 Woman with abaya dress looks at views of modern skyscrapers of Doha West Bay skyline outdoors State Grand Mosque in Doha, Qatar, Middle East, Arabian Peninsula. Sunny day with blue sky. 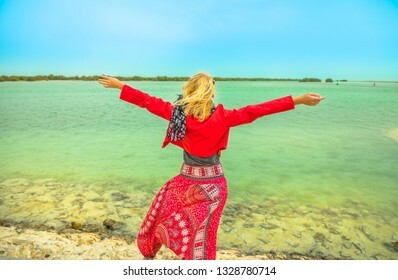 Caucasian woman with raised arms looking at the Al Thakira Mangroves Nature Reserve in Al Dhakira, a popular touristic attraction. 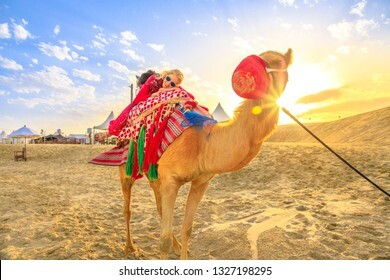 Happy blonde tourist visits Qatar in Middle East, Persian Gulf. 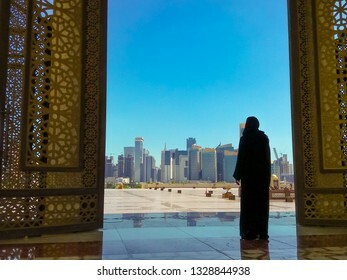 Woman with abaya dress looks at views of skyscrapers of Doha West Bay skyline outdoors State Grand Mosque in Doha, Qatar, Middle East, Arabian Peninsula. 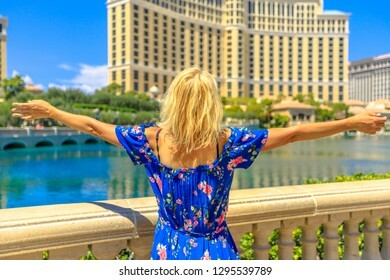 Caucasian lifestyle woman enjoying at pond with clear water in Las Vegas Strip. Blonde tourist vacation in Nevada, USA. Las Vegas cityscape daytime. American travel in summer holidays. Macau, China - December 9, 2016: Canals with Venetian bridge of the Venetian style Casino. Inside luxury shopping mall in the Venetian Hotel in Cotai Strip. 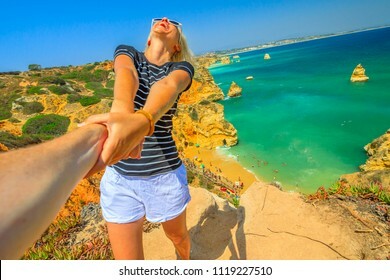 Follow me, woman holding hand at above promontory of Praia Do Camilo in Algarve, Portugal, Europe. Woman freedom at Camilo Beach. 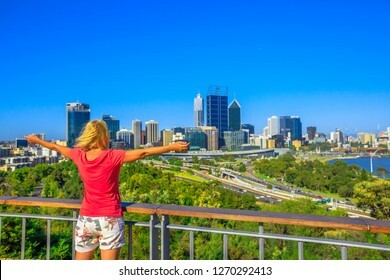 Concept of summer holidays and tourist traveler, holding man by hand. Follow me. 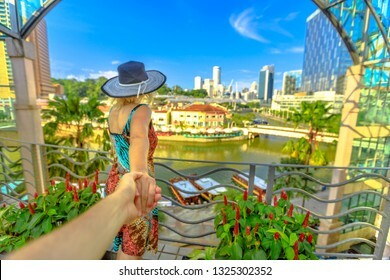 Tourist woman with wide hat holding hand of partner looking panorama from terrace over Clarke Quay and Riverside area in Singapore, Southeast Asia. 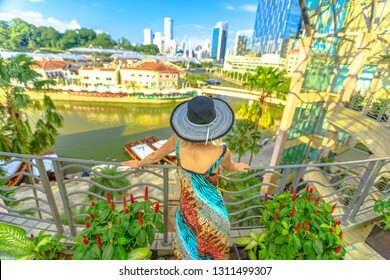 Lady enjoys on Singapore River downtown. Moon eclipse in full moon and super moon by night. 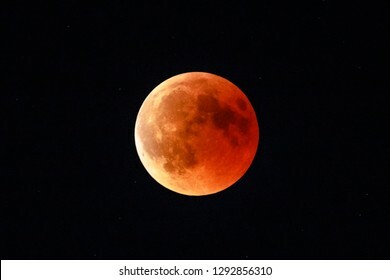 Total Lunar eclipse with moon turning red cause of closer Mars planet. Astronomical background. 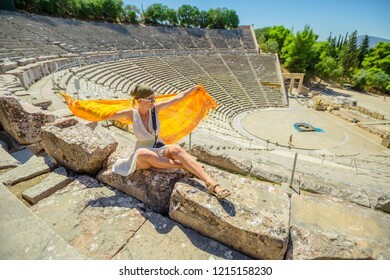 Smiling woman with orange sarong and greek clothes enjoying Ancient Theatre Epidaurus amphitheater in Peloponnese, Greece. European travel destination. Historical heritage and landmarks. Kamakura, Japan - April 23, 2017: Romon the Great Gate at Tsurugaoka Hachiman Shinto shrine.Above the gate is a plaque bearing the name of the shrine, Hachimangu, written in 1629 by Prince Ryoujo. 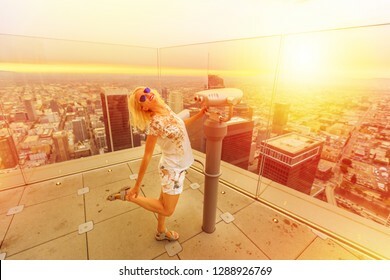 Woman traveler enjoying at binocular from Oue Skyspace Bank Tower in Los Angeles, California, United States at sunset light. Happy tourist at panoramic terrace above Downtown of LA skyline. 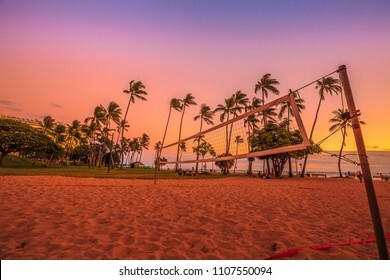 Beach volleyball net at sunset at Fort DeRussy Beach Park which is part of eight sections that make up the popular and long Waikiki Beach in Honolulu, Oahu, Hawaii. 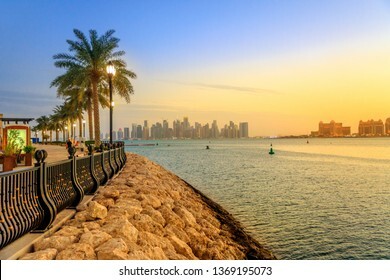 Palm trees along marina walkway in Porto Arabia at the Pearl-Qatar, Doha, with skyscrapers of West Bay skyline at sunset sky. Scenic sunset landscape of Persian Gulf in Middle East. 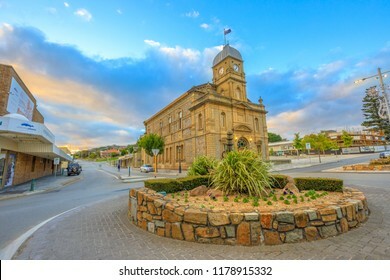 Albany, Australia - Dec 28, 2017: iconic Albany Town Hall with clock tower is opened in 1888 is the first civic building constructed in Albany, York Street, Western Australia, at twilight. 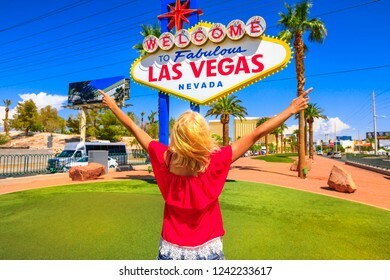 Carefree woman with raised arms at Welcome to Fabulous Las Vegas Nevada Sign, popular landmark on Las Vegas Strip at entrance of the city. Happy tourist in Nevada, Unites States. Blue sky. 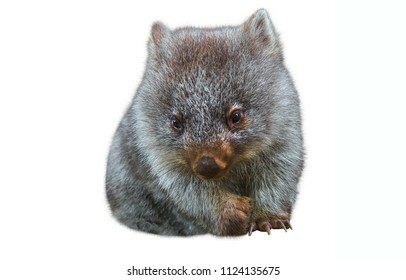 Sweet and tender little australian wombat in position marsupial. Isolated on white background. The Wombat is a crepuscular and nocturnal marsupial. 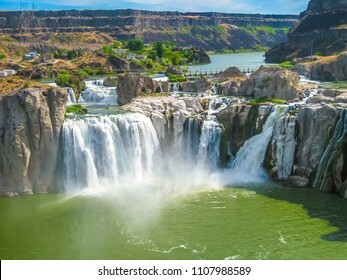 Spectacular aerial view of Shoshone Falls or Niagara of the West, Snake River, Idaho, United States. Pillars and sandstone formations seen from Praia do Camilo, Lagos, Algarve, Portugal. Camilo Beach consists of two beaches connected through a tunnel. 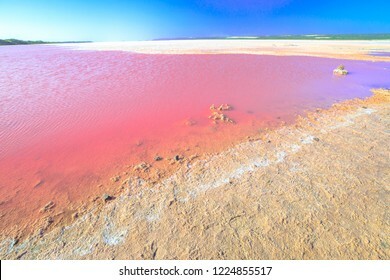 This part of beach is visible at low tide. Singapore - May 2, 2018: Universal Studios with luminous globe in Sentosa island at blue hour with pink lights. 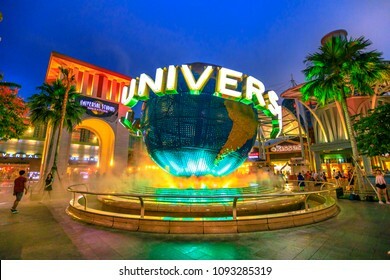 Universal Studios Singapore is southeast Asia's first Hollywood movie theme park. 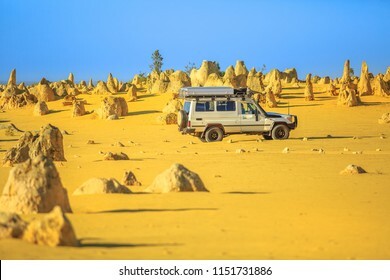 Cervantes, Australia - Dec 22, 2017: Four-wheel-drive car on Pinnacles Drive, dirt road in Pinnacles Desert, Nambung National Park, Western Australia. Discovery and adventure travel concept. Tokyo, Japan - April 17, 2017: green line of Yamanote for Harajuku, the most important train line in Tokyo. 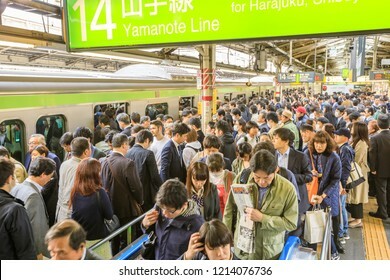 Crowd of commuters waiting for rail train at Shinjuku Station in Tokyo. 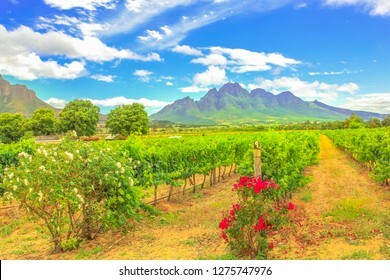 Rows of grapes in picturesque Stellenbosch, near Cape Town, wine region with Thelema Mountain on backdrop. Stellenbosch Wine Routes are one of most popular attractions of South Africa. Summer season. 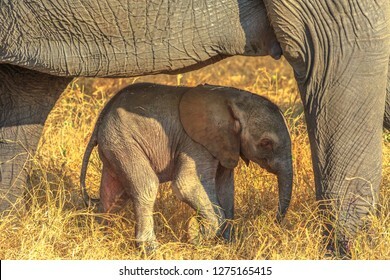 Elefant calf protected by mum. Safari game drive in Pilanesberg National Park, South Africa. The African Elephant is part of the Big Five. 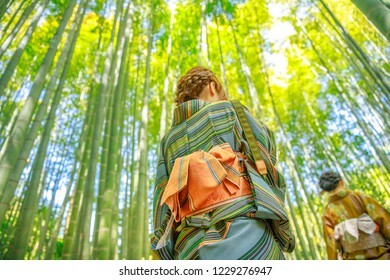 Hanami in spring season with unidentifiable women with green Japanese kimono in bamboo grove of Take-dera Hokoku-ji Temple at sunset in Kamakura, Japan city. 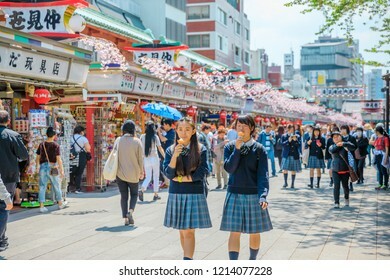 Japanese culture and lifestyle. 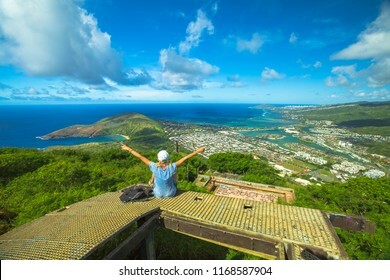 Tourism and travel in California, West Coast. 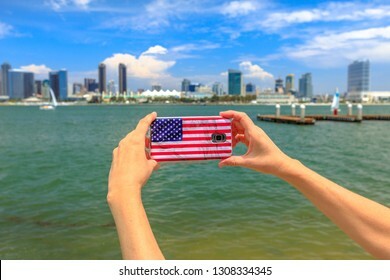 Mobile phone with American flag cover taking photos of San Diego By skyline. Smartphone shoting in summer holidays from Coronado Island, USA. 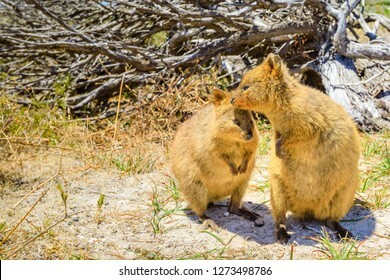 A couple of Quokka, Setonix brachyurus. 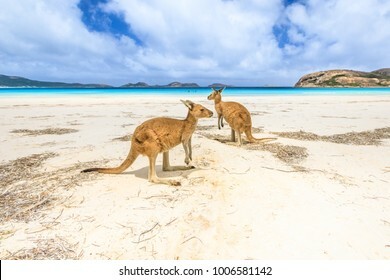 Rottnest Island near Perth, Western Australia, is the primary home of the quokka, a type of marsupial. Quokka is considered the happiest animal in the world.